Interpersonal relation and factors affecting interpersonal relations ? Performance of members of any organisation depends on their ability to effectively interact with their superiors, subordinates and co-workers within the organisation and consumers, suppliers and general public outside. Interpersonal relation, therefore is a very important issue involving any organisation. Most organisations have people problems rather than business problems. People problems are due to faulty interpersonal relations, which hinders the attainment of organisational goal. Efforts are therefore made to enhance the interpersonal skills of the people at work. Based on past experience people make assumptions about the nature of the other and of the particular kind of situation they are in (e.g. Competition or Cooperation). Each person develops positive or negative feelings that contribute to enhanced or diminished perceptions of self, the other and the current situation. These perceptions contribute to evaluation of the other person in this situation and lead to the formulation of intentions to interact in specific ways to accomplish personal objectives. The consequences of that behaviour and subsequent interactions generate new inputs for another set of reactions. When trying to understand your feelings and behaviour, it helps to be aware that how you think and feel about yourself and others may be very unlike how they think and feel about themselves and you. These different evaluation and reactions depend on each individual's self-concepts, value system; frame of reference, defensiveness, interpersonal relationship needs and feelings. (i) Self-Concept: Self-concept is a reflection of all the past experiences one has with others and includes characteristics which differentiates from others. Once self-concept is established and certain specific patterns of behaviour are adopted, it tends to resist change. In order to maintain interpersonal environment and to maximize congruence of harmony, certain mechanisms are used. 1. Misperception: Misperceiving how others look at you. 5. Response Evocation: Behave in a way that results in others behaving towards you in an amicable manner. (ii) Personal Frame of Reference: Self Concept and perception of other people and things develop into a personal frame of reference for perceiving and interpreting experiences. Two people with different frames of reference may do very different things in the same situation to try and satisfy the same need. Different needs, past experience and cultural backgrounds are a frequent source of different frames of reference. In the present business scenario where people from different culture most often work together in the same organization frame of reference enjoys a lot of importance. To understand others, one needs to understand their frames of reference without judging them in terms of one's own values. (iii) Defensiveness: Defense is a cognitive distortion that projects the self-concept against being diminished. It occurs when one protects him or her by denying, excusing or rationalizing one's action to protect self-concept against the threat of being damaged by failure, guilt shame or fear. 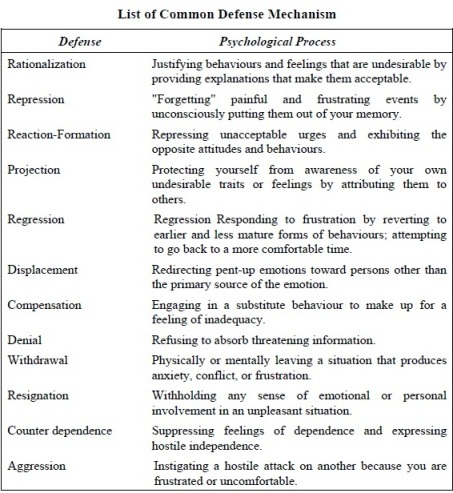 Defense mechanisms affect the way individuals relate to each other and the way they understand and adopt to their relationships. Defensiveness may distort ideas, obscure solutions and hinder interpersonal relations. One way to avoid defensive behaviour is to acknowledge what is being said as at least partially true. Inclusion: Inclusion is the need to establish and maintain relationships with other people. It concerns balancing the desire to be part of a group against the desire for solitude. Control: Control is the need to maintain a satisfactory balance of power and influence in relationship. It concern trade-offs between the desires for structure and authority versus the desire for freedom. Affection : Affection is the need to form close and personal relationships with others. It concerns balancing desires for warmth and commitment against those for maintaining distance and independence. Each of these three needs has two sub dimensions - the expressed towards others and wanted from others. If you have strong interpersonal needs you desire to interact with others are of gregarious nature. If you have low interpersonal needs you do not mind being alone and are more reserved. It has implication on ones interpersonal relation and also in career choice. Marketing and Human Resource majors need to have stronger interpersonal needs than those in accounting and system analysis. The degree of need compatibility between two or more people can make the difference between a happy and productive team and a dissatisfied and ineffective one. If one person has a high need to control and another has a high need to receive direction, they are likely to get along well. On the other hand, if they both have high needs to express control and low need to receive it, conflict is likely to occur. Awareness of difference in interpersonal needs can help you adopt your own behaviour to let other satisfy their needs, which can enhance your relationship with them. (v) Feelings: How .one expresses ones feelings is a frequent source of difficulty in interpersonal relationships. Rather than express them constructively, people often deny or ignore their own and others' feelings in an attempt to avoid rejection or struggle for control. It is the negative reaction that can cause the most problems especially if they are directed at a person one is interacting with far a long time like ones boss or a coworker. Maintaining a productive relationship requires that first you look at yourself to understand what it is about you that is carrying the negative feelings. You may then see that it is not really the other person you do not like, but a particular characteristic that you also have yourself. Then you may be able to overlook the characteristic in the others, as you do in yourself. If self analysis is not enough, it can be helpful to tactfully express personal feelings so that you and the other party can try to workout potential difficulties in a productive way. Often, what appears to be personality changes may just be two peoples' varying responses to difference and incompatible job requirements. This frequently happens when people work in different parts of the organization, under different organizational cultures, for different bosses and in different jobs that make different demands. (i) Job Requirements : Job requirements determine how psychologically close or distant two people need to be to perform their work. The depth of interpersonal relationships required by a job depends on how complex the task is, whether the people involved possess different kinds of expertise, the frequency of interaction in the job, and the degree of certainty with which job outcomes can be predicted. Work situations that are simple and familiar to both workers, don't require strong feelings, demand little interaction, and have a high certainty of outcomes call for minimal task relationships. Complex situations that require different knowledge from each person, high trust, much interaction, and have an uncertain outcome call for more intense interpersonal relationships. Openness: Is the degree to which participants share their thoughts and feelings with others. Trust: Trust is the degree that you believe someone else is honest and supportive. Owning: Owning refers to taking responsibility for a problem to which you are a contributor versus blaming someone else. Risk to experiment: Risk to experiment is the degree to which you are punished for trying something new, especially if it fails, versus doing things in safe, approved-of ways. (iii) Trust Level : Relationships do not grow and develop until individuals trust each other. Trust is learned from past interactions with another. Trust is developed as the parties self-disclose personal information and learn that they will not be hurt by making themselves vulnerable to each other. Increased trust leads to the sharing of more personal information between the parties, which enhances regenerative interaction patterns and contributes to improved problem solving and productivity. In his best-selling book, “The Seven Habits of Highly effective People”, Stephen Covey uses the metaphor of an "emotional bank account" to describe the amount of trust that has been built up in a relationship. To covey, trust refers to the overall feeling of safeness that you have with another person. You make "deposits" into an emotional bank account with another person through kindness, honesty, and keeping commitments. These acts build up a reserve trust account that promotes confidence in you even if your communication is sometimes ambiguous or you make an occasional mistake. But, if you show disrespect, fail to honour commitments, or take advantage of the other person, your trust account becomes depleted. The relationship then becomes degenerative, with hostility and defensiveness making it difficult to build up trust again.